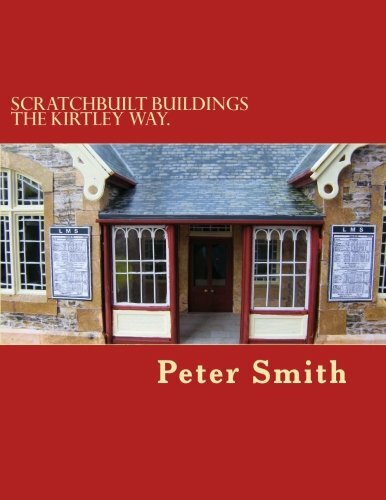 Scratchbuilt Buildings the Kirtley way: How to make model buildings and other structures from scratch in easy to follow stages, by Peter Smith of Kirtley Model Buildings. Peter Smith is a full time architectural model maker and master of his craft. He produces some exquisite buildings. In Scratchbuilt Buildings the Kirtley Way he shares his art in some very easy to follow and detailed chapters which will givew the reasonably competent modeller a good chance of building his own buildings from scratch. Every model railway needs buildings but they pose a challenge to the modeller like nothing else. Done well they will make the layout, done badly they will do the complete opposite. Buildings give a sense of period and location in just as big a way as locomotives and rolling stock. While there is a great range of ready made buildings and kits available these days, taking one of these can just simply make your layout look like everyone else’s. Equally taking a GWR station building and placing it on a LMS layout is no different to repainting a Duchess in LNER apple green. Armed with Peter’s new book there is no excuse. I’d recommend this book in conjunction with Peter’s other recent book on Station Colours, which shows in detail the painting schemes for railway buildings of each UK company from 1900 to the end of steam. ← Modelling Scenery the Kirtley way.